90 degrees outside, and 81 degrees inside... hot day! It was really nice when I finally got out this morning, so Jaani and I walked up the river to the bridge on the trail. It was a nice walk. Jaani and I usually go the other way because going up river there are a lot of run off streams and little beach areas to keep Jaani cool. I took this picture from the little beach under the bridge. The river is very hight today, only 7 or 8 inches below the trail in some spots, but that is kinda normal this time of year with all of the melting going on at Mt Rainier. The water is ice cold, and just what Jaani needs to cool off his fur while we were walking. I was fine with a bottle of water, and Jaani liked water too, but he was really happy to just spend about 5 or 10 minutes laying down in the water. I have to say I can't blame him, I took my shoes off and stood in the water for a little bit myself. It feels like summer out here. This heat wave just came out of nowhere, and boom, we have nice weather. I hope it keeps up through tomorrow, that would be just perfect. so, there's a little update for today, I noticed the links I put up on twitter got converted so they weren't links anymore, so here are the links to my blog album, and my travels album. I have Geo-tagged all the pictures. So there is a map view of each album where you can look at a map, and each picture is positioned on the map, or you can click on an individual picture, and see a map of where that picture is from down on the right side of the page. I like the feature a lot, and I feel it gives more significance to the pictures. That's all for now, it's still too nice outside to be stuck indoors. It was such a nice day today! It was hot and sunny... I admit yesterday was nicer (that is actually when I took the picture above) [nicer] in a more comfortable kind of way, but it sure was nice to just get outside! I started my day (after work) with Jaani's usual walk on the Cedar River trail. 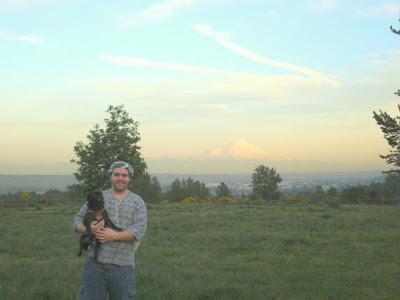 Grand View dog park, looking at Mt Rainier. However, I have to say that I did enjoy getting out today, Jaani got to run around off the leash, and I walked casually around the park. It was nice to put on some sandals and shorts, along with this shirt that I am pretty sure came from the Bahamas or something.. where ever it came from, it sure is a good shirt for hot sunny days! So, that is a few pictures to show where I hang out when it's nice outside. I even walk the trail when the weather is not so nice. Tomorrow I am going to put an ad on craig's list for the astro, I just want to blur out the license plate number on the picture I took of the back of the car. anyway, until next post, watch the twitter feed, and I intend on adding some new pictures to my Picasa web album at some time this weekend. I will probably post which albums they are in. The weather all up and down the west coast is hot! My side bar tells me it's 75 degrees in Renton, and I don't doubt it is at least that hot outside. The sun is shining, and I am ready to go home... only a couple hours left until I am out of here. Work is a little slow right now, which makes it hard to just sit in the office. I am still waiting for the test libs to be written for my area, which is kind of a bummer. I have pretty much just been sitting here all day reading my news feeds in Google Reader. Luckily I have a lot of subscriptions to read, and all the blogs are pretty active. I like having the nice weather, but it does concern me that we are hitting a record high today for this area. Plus the record was set last year, which beat the record set two years ago... I am starting to see a pattern of it getting hotter every year. I am sure that Jaani is doing fine at home, I opened all the windows in the apartment, and made sure he had fresh water in his cage; that should hold him over until I get home. anyway, I have some pictures I need to post from yesterday, and I think I will go over to grand view and take some more today. I'll have to get those up. Also, I just got the title for the Astro in the mail, and yesterday I took a few pictures of that to put up on craig's list. There is a full update. more will come with the pictures this weekend. we are approaching sun rise here in Seattle. I have been awake for over 24 hours... and still in "hurry up and wait" mode. With a little bit of luck we will get things up and running before too long. I woke up this morning (Monday 5/5/08) earlier than usual (at 6am). I caught an earlier bus than usual, and the bus was packed! I had to stand all the way until the bus got to Bellevue (20 minutes or so)... after that I got to sit for the remaining 10 minutes to Redmond and finished one of the books I got from the Library (Titled Google and the mission to map meaning and make money). It is a good book; it tells the story of a student from the University of Maryland (Sergey Brin) and another student from the University of Michigan (Larry Page) who came together at Stanford to create a system of rating pages. After years of development (and an attempt to download the internet onto a computer in a day or two) the system now known as PageRank revolutionized the field of searching indexies of the Internet, and developed the first brand (and word for that matter) to become a universally recognized verb that means "to search" in every language on the planet. (well at least over 100 of the spoken languages on the planet.) As a result the face of Internet search was changed forever, and few could imagine a world without Google. In the background Sergey and Larry became billionaires in a record time span, and things are looking to only go up. So, once I got to work, we had a press release most of the day. The bloggers were here for all the major news agencies. (For those of you who don't know yet, nearly all news stories start as blog postings these days; On average, and with the exception of current events, a RSS news feed will give you the news a full day before it is published in a news paper or on broadcast news.) They were walking around the building all day trying to get us to spill the beans on some hot juicy exploit or bug... crazy news people. I actually gave a short speech about my areas (Cart and Meld.) I am concidered the expert on both areas because that's what I focus on all day long. So I told them first what the areas are (only without the technical jargon) then I started to explain why these items are so cool! I have to admit it was harder than I thought because I wanted to say too much! I managed not to give any of the future release info up, which makes me happy because I didn't violate my NDA! After work, I went home a little early, and spent a few hours with Jaani. We went for a walk, watched Charlie Wilson's War, then I took him outside again and left to go back to work. I have been sitting here ever sense. So, that brings me to here... it's 6:30AM PST... I have reached the point of being tired... then went to work... became exhausted... forgot that I was tired... remembered... and am left in a state of limbo where I can't really remember if I actually went to sleep or if I am still awake... I actually stopped trying to figure it out because it was too distracting form the task at hand. So, I better say goodbye so I can continue to hurry up and wait! anyway, just remember... I am not crazy... I merely have a healthy disregard for the impossible.